New fiction by author Ralph Sanborn probes the mind and motivations of an international assassin. China Red plunges the reader into a world of evil intrigue and high adventure... You won’t be able to put it down. Meet Caleb Frost – professional assassin, highly trained, embroiled in the messy business of termination, and searching for justice, no matter the lengths he must go for it. 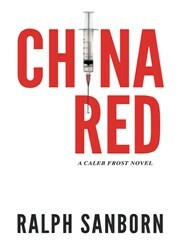 Debut author Ralph Sanborn immerses his readers in Frost’s complex and violent world with China Red, his first novel in the Caleb Frost series. Written in Sanborn’s brutally frank, signature style, China Red is a character-driven story of complicated relationships and very wet, black ops, focusing on the government-backed assassin, Caleb Frost, and his team. Featuring exotic background locations from Paris to the western mountains of China, roaring motorcycles, violent conflict resolutions, and explosive action set in the murky underworld of international drug smuggling, China Red is a first-rate thriller. Ralph Sanborn was raised in Hastings-on-Hudson, New York, and earned a degree in psychology from St. Lawrence University. He has lived in several different countries and worked in a variety of manufacturing and software enterprise marketing capacities. He currently lives in Northern California.